5 thousand ringgit" by mere registering in the websites and wait for weird men in black suit to follow to tail u while u doing your daily chores whatever it is . 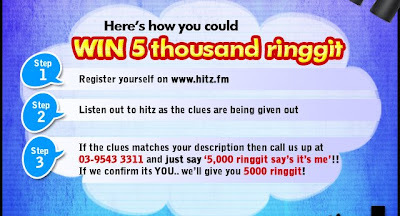 Then listen carefully for the clues given over radio before calling the hitz.fm and tada "U won RM 5,000". Until today, there is already one lucky winner with RM 5,000 in his bank account and one ,minus the RM 5,000 since she did not call in. Anyway, good luck if u entering the contest! queen: i managed to call during the que to call for hitz.fm but alas i not the ONE. U should try and try again !